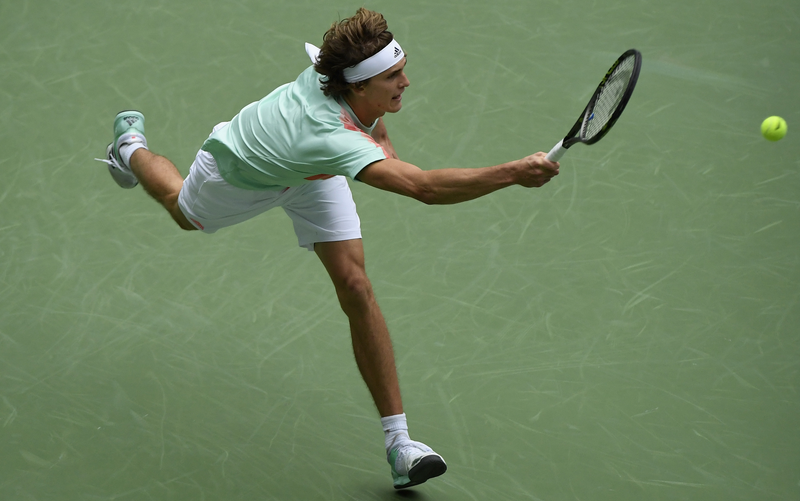 At 6-foot-6, Alexander Zverev cuts a tall, almost skeletal figure on a tennis court. Curiously, the German 19-year-old’s path through the Shanghai Masters pitted him against the other extremely large tennis men, John Isner (6-foot-10) and Marin Cilic (6-foot-6). Zverev won both matches. One of the reasons for that success is that he boasts the pace and reach of a tree-sized slugger, but moves like a much smaller player. It’s easy to forget Zverev’s size while watching his court coverage and footwork—fluid, nimble, anticipatory, always plenty of time to set up his strokes. His match against Isner offered a controlled comparison: the German seemed to move in ways that his opponent can’t physically muster. Although Zverev went up 4-1 in the last set against Jo-Wilfried Tsonga, he lost the third-round match at Shanghai. But he did showcase some of that defensive mobility and range along the way, especially in these back-to-back points, both of which end in down-the-line backhands, thwacked on the run. Zverev has nudged his way into the top 20 in the world. As long as the usual tall-man injuries don’t hobble him, he will likely stay up there for the next decade.